Vicki’s “Sh*t Stacks” | What Smells So Good? Ah, bake sales. The school year's full of them! As if that wasn't enough on it's own, December brings along cookie swaps, gift bags, parties and coffee nights, and of course there has to be something sweet at the table every time! Whenever I think of bake sales (or anything to do with my senior Reach team, in fact, who are all in the photo below), I always have one delicious (and hilarious) treat coming to mind: Vicki's Sh*t Stacks. Vicki's an awesome girl. I mean, along with being the fundraising queen and captaining the Junior Reachers at J. Clarke, she was part of the quilting club, the Sears Drama Festival and God knows how many other things! I have no idea how she fit it all in to 5 school days but she did! These were her eternal contributions to our twice-yearly bake-sale fundraisers on Parent-Teacher Interview nights, and she always had to bring at least two or three batches of them each time, since us greedy geese would always down one ourselves while setting up! I almost didn't get this recipe, however. When I graduated, I realized that I would never get to indulge in the famous Stacks again (unless I made a special trip, but come on, I was in Ottawa!). Being the oh-so lazy person I was, I left a note in her yearbook with my number so I could get the recipe off her. Lo and behold she calls me, dictates the recipe to me and wishes me well in case she never saw me again (as if!). I've been lucky to see her a few times since at my friend Emily's birthdays, but have not had one Sh*t Stack since that last PT interview. Odd the things we miss! This is yet another entry (of many, I hope!) 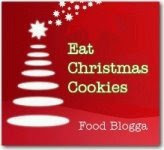 for FoodBlogga's awesome event Eat Christmas Cookies. Keep checking the recap, it's always getting updated! Boil the first 3 ingredients. Remove from heat, add vanilla and bring to a boil again. 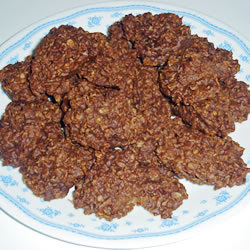 Remove from heat and add the oatmeal, coconut, salt and cocoa powder. Drop heaps onto wax-paper lined sheets, chill completely. Love %$@& Stacks...but we always called them Haystacks...wink...wink..